The Jura GIGA X9 Bean to Cup Coffee Machine produces its drinks at the touch of a button and uses fresh milk to produce cappuccinos and lattes, with up to 20 different coffees able to be easily programmed. Each drink may be individually tailored to customer taste in terms of strength, size and mix of coffee beans. 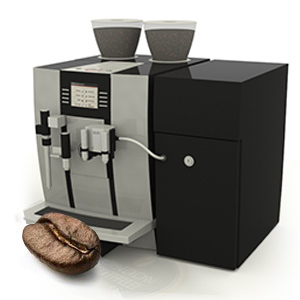 The 2 coffee bean hoppers allow customers to use 2 types of coffee bean which in turn may be blended into each type of coffee in any proportion that you desire. A separate steam lance permits customers to froth milk or chocolate by hand should that be a requirement. There is a separate heating block for each of the milk, coffee and hot water systems. The upshot of these 3 thermo-blocks is that drinks may be made one after the other with little or no down time. Typically an automatic bean 2 cup coffee machine with a footprint this small will allow customers to make 2 black coffees/espressos simultaneously. 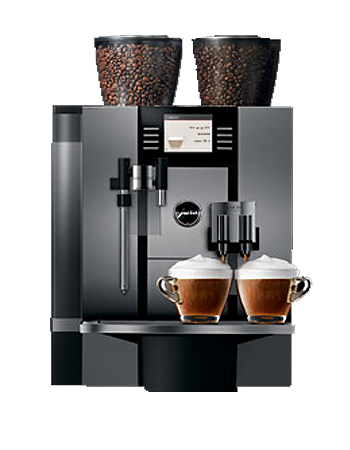 However the Jura GIGA X9 will also permit customers to make milk based specialist coffees such as macchiato, cappuccino or latte 2 at a time. The machine is fully automatic (one touch of a button to obtain a coffee) and is suitable for sites wishing to dispense up to 200 coffees a day. It may be plumbed into the mains water supply and fitted with a commercial water filter or run as a manually filled system with an in-tank Claris filter. In either case it is of the utmost importance that a water filter is fitted and changed regularly in order to maintain the reliability of the machine (this is particularly the case in London where the water is very hard). Also available are 2 modular milk fridge units that can hold either 3 or 5 litres of fresh milk depending on usage requirements as well as cup warmers, payment modules and even trolleys for the X9 to sit on. The Jura GIGA X9 is very easy to maintain with simple cleaning, rinsing and descale cycles that may be activated at the touch of a button and are clearly explained by the TFT screen on the front of the X9. The machine will automatically run these cycles with very little need for human assistance. This allows customers to quickly, easily and efficiently conduct the daily cleaning routine which is necessary for all bean 2 cup coffee systems, particularly those which use fresh milk. The ease of these cleaning processes means that no specialist knowledge is required to look after this machine on a day to day basis, making it suitable for a great many applications. We can provide these machines and all of the service support for them that you may require across London as well as areas such as Buckinghamshire, Hertfordshire and Berkshire. We carry all of the cleaning products, water filters and a range of coffee beans for use in these machines. We have our own team of technicians, delivery drivers and sales consultants which allow us to offer a first class service across the area. Need some help? View our support section for more cleaning information as well as troubleshooting information. Our in-house team of technicians are on hand to solve any problems that you may have with your Jura X9c Bean to cup Coffee Machine, or any of our other other rental or Lease coffee machines. Advice is also available over the phone and online at with our range of animated cleaning guides and trouble-shooting guides. Our typical response time to fault calls is less than one working day.